This fragment is carved with two volutes of a loose, horizontal acanthus-stalk scroll above a moulding fillet. Stylistically the carving suggests the frieze of the columned room of Hadrian's Villa at Tivoli and architectural enrichment found thereabouts1 . These panels are at present (?1970s) stored in the first room to the left in the Antiquario or Casino Fede on the villa site. When compared with the Soane fragment M1124 (Vermeule no.152) which Vermeule proposed assigning to the Ara Pietatis Augustae, the work is drier, flatter, and shows dull points at the edges of the leaves - signs of a Hadrianic dating not found in the finer work of the Augustan and Julio-Claudian periods. 1Gusman, Villa Hadriana, p. 237 ff., fig. 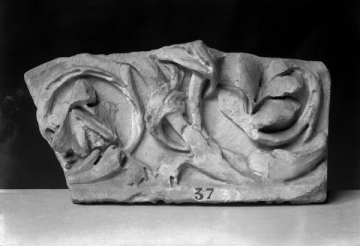 354; also the marble frieze fragment from Nympheum A., p. 86, fig.109.